We decided to visit the Istanbul Archaeology Museums on the grounds of the Topkapı Palace outer gardens. Inside, they have a breathtaking collection of glazed brick reliefs from ancient Babylon. Many major museums around the world have lion reliefs from the processional way but in Istanbul they have bulls and “dragons from the actual gate. The Ishtar Gate, named after a Mesopotamian goddess of love and war, was one of eight gateways that provided entry to the inner city of Babylon during the reign of Nebuchadnezzar II (reign 605-562 BC). It was decorated with glazed blue bricks that depicted alternating rows of bulls and dragons. A processional way went through this gateway and was decorated, in part, with reliefs of lions. Every spring a procession that included the king, members of his court, priests and statues of the gods traveled to the “Akitu” temple to celebrate the New Year’s festival. The Processional Way was paved with red and yellow stones inscribed with a prayer from Nebuchadnezzar to Marduk and flanked by soaring walls of enameled tiles decorated with lions and flowers. The Assyrian empire fell before the combined onslaughts of Babylonians and Medes in 614 and 612 B.C. In the empire’s final days, Nabopolassar (r. 625—605 B.C. ), who had been in Assyrian service, established a new dynasty with its capital in Babylon. During the reign of his son, Nebuchadnezzar II (604-562 B.C. ), the Neo-Babylonian empire reached its peak. By the reign of Nebuchadnezzar II, the city of Babylon had existed for almost 2,000 years and had seen its share of good and bad times. Nebuchadnezzar II came to the throne at a time when Babylon was achieving unparalleled prosperity. By the end of his reign, the city would control an empire that extended, in an arc, from the Egyptian border to the Persian Gulf. The city’s good fortune meant that Nebuchadnezzar II was able to embark on a building program that would see an older Ishtar Gate torn down and a new one, with blue glazed bricks, constructed. He also built a new processional way that went through the gate. 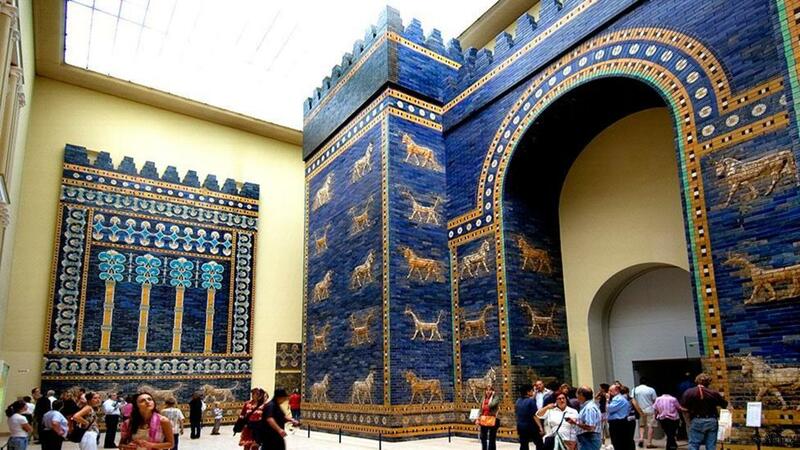 The Ishtar Gate, built by Nebuchadnezzar II, was a glazed-brick structure decorated with figures of bulls and dragons, symbols of Adad, the weather god, and Marduk. The relief of a lion, the animal associated with Ishtar, goddess of love and war, served to protect the street; its repeated design served as a guide for the ritual processions from the city to the temple. 1932 Photograph of the Ishtar Gate from the Library of Congress Prints and Photographs Division Washington, D.C. The gate was excavated between 1899 and 1917 by a German archaeological team led by Robert Koldewey. After World War I part of the gateway, the smaller antegate, was reconstructed in the Pergamon Museum in Berlin and is on public display. Additionally, the museum has the remains of the larger inner gate, which rose an estimated 25 meters (82 feet) off the ground from the roadway to the top of its towers. 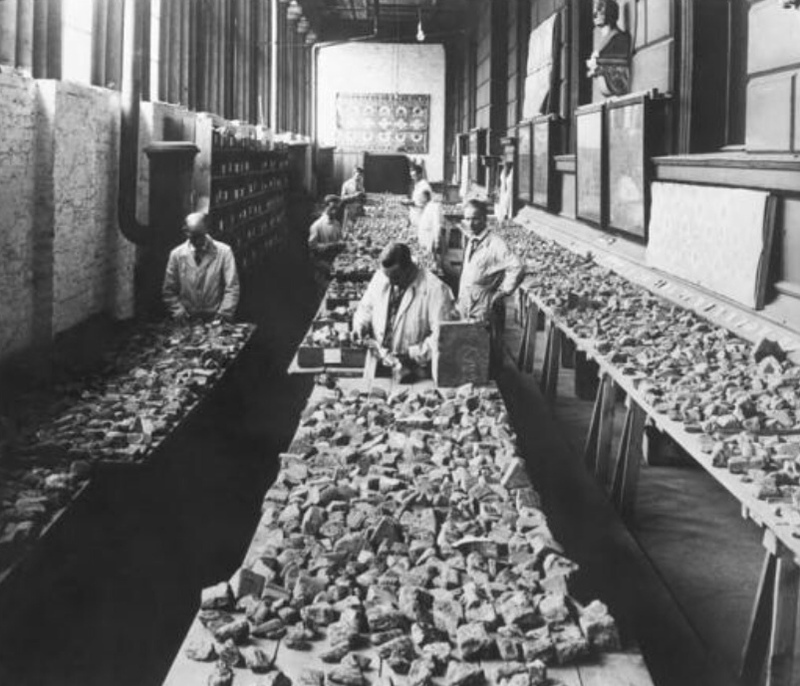 German archaeologists worked at the site for 20 years, until the outbreak of WWI. They took with them many treasures, including most of the friezes, each depicting a golden lion, which lined Babylon’s Procession Street. There were 120 of them, 60 on each side. The Germans took 118. The French took a share of Babylon’s treasures to the Louvre and the British helped themselves between the wars, when Iraq was a British protectorate. When Koldewey began the archeological excavation in Babylon, he found a mound of earth or tell with hundreds of colored brick fragments. Koldeway, his assistant Walter Andrae, and an army of workers had to work for years to reconstruct the architecture of Babylon. The fragments that Koldewey found at the excavation site seemed to indicate lost works of art. Koldewey also unearthed fragments of colored brick from the area, which were identified as remnants of the Processional Way. The colored fragments of the Processional Way and the bas-relief of the Ishtar Gate did not match one another. It was therefore Andrae’s job to sort out possible connections. We learn from Andrae’s memoirs that he found the job particularly difficult; there was no indication how the colored fragments could be assembled. The colored fragments were moved to Berlin, where they were cleaned and coated with paraffin in 1927. The following year Andrae entrusted the task of sorting and reassembling the fragments to an expert in sculpture-casting, Willy Struck. Together with 6-8 assistants and the “patience of angels”, they classified hundreds of thousands of pieces according to types of animal or decorative motif. Thus eye pieces were all put together, tail pieces and so on, regardless of where they were found. The implication was that all the lions had been cast from the same mold and then would be recreated in the same form. The face of each brick had to be reconstituted from 6-7 fragments which may or may not have been together originally. When no fragment from the pool seemed adequate to fill in the missing part, Andrae used modern bricks manufactured by three factories near Berlin. Glazed brick was fired at least twice, perhaps three times. The first firing formed a tile body called a “bisque”. The biscuit firing had the highest temperature at 1060 C that fixed the tiles for size and shape. After glazing the tiles were glost fired at about 1020-1240 C. Glaze decoration was fired at 750 C, just before the glaze began to melt. 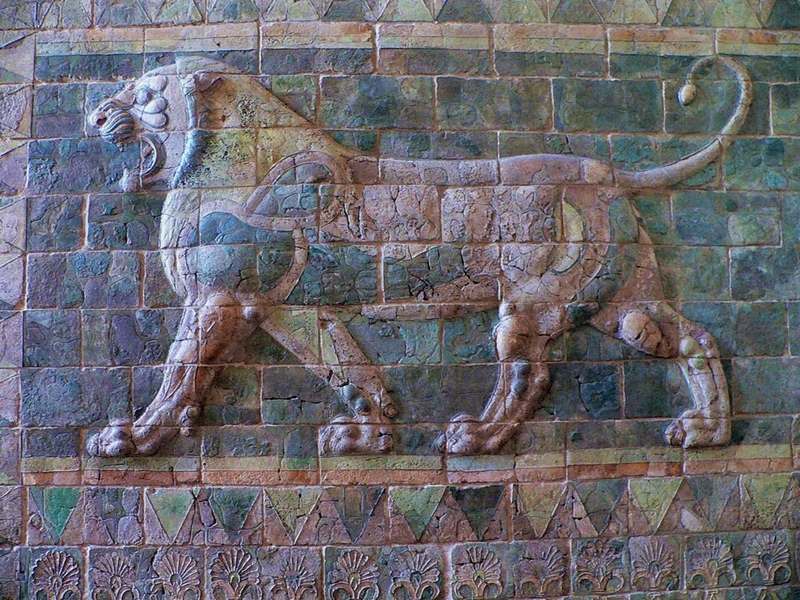 Note the similarity of the Persian lion above, probably created in Babylon, to the Babylonian lions of Nebuchadnezzar. Blue was an unusual and highly valued color in Babylon due to the blue color of the rare and highly expensive lapis lazuli. The appearance of an entire street and gate in blue would have been exotic, expensive looking and made the Processional Way one of the seven wonders of the world until it was displaced by the lighthouse in Alexandria. Andrae offered two “exemplars” as he called them, to the Istanbul Archaeology Museum and the Baghdad Museum in Iraq because these institutions negotiated the division of finds before and after the war. Others were sent to Vienna, Paris, Coppenhagen, Gothenburg and to Chicago, New York and other US museums. Interestingly, the British Museum does not have a lion, although in December of 2013 they hosted an exhibition from the Vorderasiatische Museum (Pergamon Museum), Berlin. Note the upturned tail in this reconstruction. The figures on the actual Ishatar Gate were a completely different matter compared to the lions of the Processional Way. Unlike the Processional Way, where no lions had remained intact, Koldewey unearthed a number of dragon and bull figures on the foundations of the gate, which had been stripped of their color and glazing. Koldewey estimated that at least 13 rows of alternating dragon and bull figures had decorated the gate. 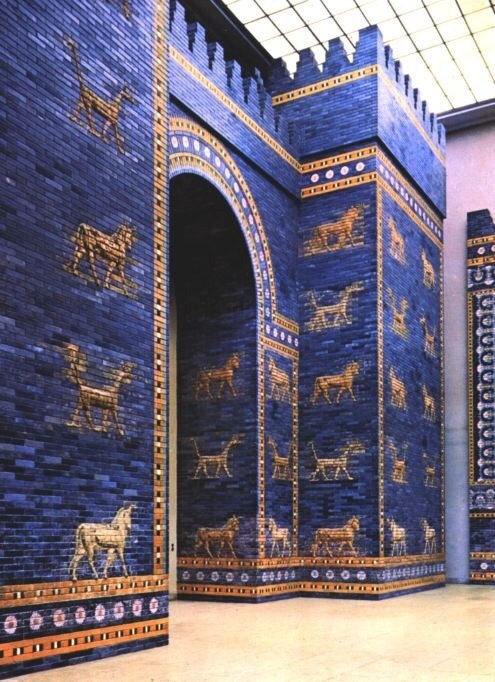 The walls of the gate are ornamented with reliefs of aurochs, the holy animal of the god Adad, and the dragon sirrush (or mushhushshu), the holy animal of Babylon’s chief god, Marduk. Meanwhile, the reliefs of lion, the holy animal of the goddess Ishtar, were ornamenting the two sides of the Processional Way. The monumental way started from the Temple of Marduk in the city center, passing the Ishtar Gate and ending at the “feast house” outside the city wall, where the New Year’s celebration was held. Aurochs are the ancestors of modern cattle, in this case bulls. The dragon-like creature was called “Mušḫuššu.” This creature is the “sacred hybrid” of Marduk, the imperial god of Babylon who had a large temple in the city, and his son Nabu. The Mušḫuššu was viewed as a menacing hybrid with leonine features and a snake’s head which spouted two erect horns or a long horn, bent back with a curling end. Its long forked tongue sometimes hung from its mouth or, alternatively, was depicted as if spitting fire. Note the relatively intact bricks of the dragons, these must have come from the foundations of the Ishtar gate.